Last month's inaugural season of performing arts at NYU Abu Dhabi Arts Center started off with a bang with sold out tickets to the two performances. For October, the line up includes something for all ages. A giant public construction site, We Built This City uses thousands and thousands of cardboard boxes and the energy of kids and families to build a magnificent imagined city. Buildings go up, are pulled down, redesigned, extended, walked through and reconstructed before the whole thing is knocked down into a gloriously chaotic heap of cardboard rubble. It simultaneously places children in the role of performer, creator, audience and architect. It is not a play… it is play. Underscored by a rocking soundtrack from an on-site DJ, the participants are guided by performers who play construction workers, facilitating free play, performing as hilarious characters and setting tasks which bring people together in unity. With a building-stomping finale, kids of all ages are in for a memorable day. Note: These are not “performances” with a beginning, middle, and end. Each session lasts up to 2 hours, and audiences can come for as long or short as they wish, within that period (think of it like going to the playground). Detailed timings for each date can be found here. In They Rose at Dawn, Ramaswamy, the co-artistic director of Ragamala Dance, examines and celebrates how we as humans endure and thrive through our transmission of wisdom from one generation to the next. As a lone dancer on stage accompanied only by a stellar Carnatic musical ensemble, Ramaswamy, whose work has been described as “thrillingly three-dimensional” by The New York Times, creates a beautiful and powerful meditation on the feminine through the dynamic interplay between movement and music. Navigating inner and outer worlds, women are the primordial source of all creation: the compassionate mother; the lover; and the embodiment of power and strength. For Ramaswamy, these intergenerational conversations provide a forum to create intricate and complex worlds that convey a sense of reverence, of unfolding mystery, and of imagination. Bridging ancestry and the personal, lineage and a new breath,They Rose at Dawn reflects the intertwined truths of history and the present moment that exist within all of us. Resonant harps and lyres from up and down the river have learned new musical modes, while buzzing timbres and ingenious polyrhythms support vocals in more than ten languages. Instruments that parted ways millennia before are reunited and pushed into new places. Love songs have crossed geographic and linguistic barriers to forge new, close friendships. A powerful pan-Nile percussion section drives this orchestra of Ethiopian masenko (single-stringed bowed lute) and saxophone; Egyptian ney (end-blown flute), oud (pear-shaped, lute-like stringed instrument), violin, simsimiyya (plucked lyre), and tanbura (long-necked stringed instrument); and Ugandan adungu (arched harp), bass guitar; and vocalists singing in almost a dozen languages. NPR named Aswan, the project’s debut album, one of the “Five Must-Hear International Albums” of the year. 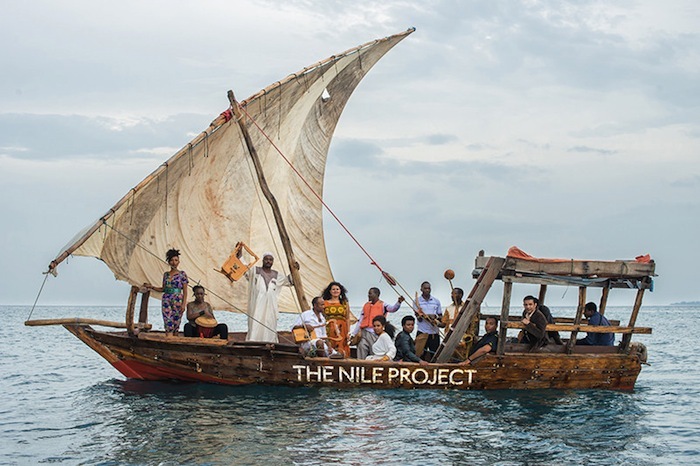 The project inspires, educates, and empowers Nile citizens to work together to boost the sustainability of their ecosystem, and it unites musicians to learn from one another and translate their common experience into music composed collectively.